The origin of the Tibetan luni-solar calendar, composed of either 12 or 13 lunar months, each beginning and ending with a new moon, is not clear. However, many scholars attribute the 60-year cycle to India; it would have been introduced into Tibet by Chandranath and Tsilu Pandit in 1025 CE. The calendar’s main characteristic is that, like the Chinese zodiac, twelve animals are associated with the five elements, making it a cycle of six decades. Recently we entered the Earth/Boar Year; it is worth remembering the momentous events which took place during the previous Earth/Boar Year when the Roof of the World witnessed a popular revolt. 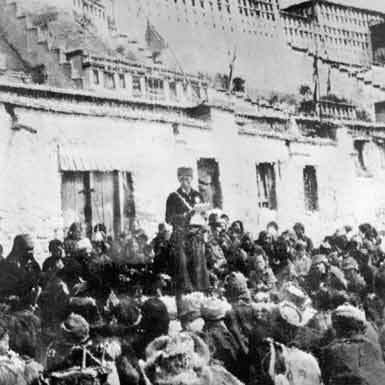 Though the Dalai Lama accepted to go “with a minimum of fuss and to take along only a handful of staff,” it was not acceptable to the population of Lhasa. On March 10, while walking in his Summer Palace (Norbulinka or Jewel Park) the Dalai Lama heard loud noises at a distance, people “were pouring out of Lhasa and heading in our direction. They had decided to come and protect me from the Chinese. All morning their numbers grew. …By noon an estimated thirty thousand people had gathered” …it was the entire population of the Tibetan capital. Apart from the Dalai Lama’s version, we have the first-hand account written by Major SL Chhibber, the Indian Consul General in Lhasa. Sixty years later, reading these accounts, one is struck by the fact that March 10 ‘Uprising’ (as the Tibetans call it), was primarily a people’s movement like the Bastille Day in 1789 in France. It was an entirely spontaneous revolt with its origin in the resentment of the ‘masses’ against the occupiers. A few thousand Tibetans lost their lives during the next few days. The rest is history. The Dalai Lama crossed the Indian border, north of Tawang on March 31 and was received by Indian officials who gave him a letter from Prime Minister Nehru, welcoming him …as a refugee. The popular movement had started in 1955 in Kham province of Eastern Tibet and had spread to the North in Amdo and Golok regions: “In 1955 and 1957 it took shape of an open revolt against the Chinese regime in these areas. These people, though did not succeed, but they were a constant headache to the Chinese who had to resort to aerial bombing and deploy large number of forces to subjugate the local inhabitants. During operations numbers of monasteries were destroyed and the local people suffered heavy losses,” explained Chhibber. Sixty years later, no miracle has taken place, though the Dalai Lama’s escape triggered the first clashes with China on the Indian border a few months later. There is another twist to the story; since 2009, China celebrates March 28, the bloody end of the revolt in Lhasa, as the Serfs Emancipation Day; on that day, the Communist ‘reforms’ could finally be implemented on the Roof of the World. The Tibetan government was declared ‘illegal’ by Communist China as the so-called serfs had been liberated from feudalism and theocracy …by guns. It is sadly ironic as the March 1959 revolt was only the Tibetan masses’ reaction against the occupiers. Unfortunately, sixty years later, the 1959 ‘uprising’ has been forgotten and politically, the Dalai Lama is more isolated than ever; no nation being ready to antagonize China, which has become the second most-powerful nation of the world …and is dreaming to become the most powerful. And bloodshed there was, but it firmly consolidated the position of the Communist regime which still controls the restive nation with an iron hand. This article A Popular Revolt Suppressed in Blood appeared in Strategic News International. Nepal invaded by China, for India’s good?